Yesterday, one of my students, who’s a reporter, told me her most recent article was about the sharp rise in zoo visitors in Japan. There were a whopping 40 million visitors to zoos in 2007, up from a few hundred thousand, ten years ago. That’s a huge increase. And that’s a third of the entire Japanese population. We discussed what factors might have contributed to the sharp increase. She speculated that it was because zoos have been trying to be more innovative and interactive. Whatever the reason, I happen to have contributed to that number since I’ve gone to a zoo 4 times in the last year. On the one hand, I have deep reservations about confining animals for human pleasure. On the other hand, I love to be among wildlife and look at animals. So while I feel awe at the wondrous variety of living creatures, I also leave feeling a little depressed at the conditions of some of the cages. Some zoos are active in conservation efforts and others are just props for human recreation. Most are a blend of the two. There are three zoos in the Tokyo area. There’s the Inokashira Zoo, which I’ve written about previously, lies on the props for human recreation end of the spectrum. 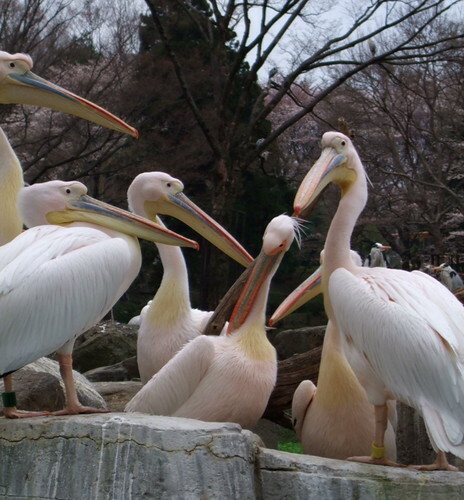 The Ueno Zoo is the largest and most well-known. The best zoo is the Tama Zoological Park. 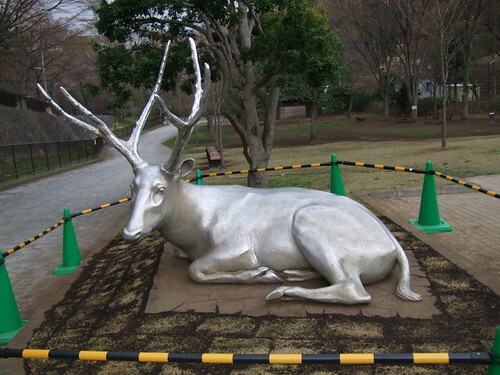 Unlike the other two zoos, the Tama Zoo is in the suburbs. It takes almost an hour to get there from central Tokyo. But it’s well worth the trip. Also unlike the other two zoos, the Tama Zoo tries to do away with traditional cages. Instead, its animals are placed in large open areas that mimic their natural habitats. It’s far from perfect. Some of the habitats are much smaller than what they would experience in the wild. But as far as zoos go, the creatures could run around a bit, as opposed to pacing back and forth behind bars, like they do in most other zoos. And they can hang out among trees and dirt, instead of plaster and concrete. The zoo is ensconced at the foot of some small mountains, and most of it is like a big park, where you can get a decent workout hiking around between the exhibits. The zoo is separated into four zones. The Australian Garden is the smallest, and consists mostly of nocturnal creatures that were difficult to see, and koalas, who are about as exciting to observe as sleeping homeless men. You can also enter the kangaroo habitat and be among the curious joeys. 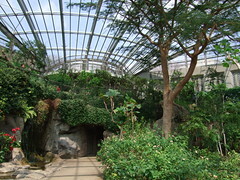 The Asiatic Garden and the African Garden were the largest and most varied zones. Many of the herding animals were placed in one big area. The lions are in a large crater-like pit, where shuttle buses drive visitors among them. Mostly, the lions slept and kept a wary eye on the gawkers. An unusual feature is the Orangutan Skywalk. Ropes and cables that span a section of the zoo connect two enclosures and orangutans move between them. I’m a big bird fan. And raptors, or birds of prey, are my favorite. There were species I’d never seen up close, like the intimidating harpy eagle, and the fluffy but sizable snow owl. Most of them were kept in a spacious netted cage where they had enough room to glide around. That was cool. Among the mammals, I loved watching the red pandas. I’d never heard of them before I saw them in Ueno Zoo. They’re active and, (maybe I’ve been in Japan too long), so damn cute. I even broke down and bought a red panda stuffed doll. I originally planned on giving it to my nephew, but sorry JJ, I think I’ll keep it for myself. I learned that this was the original panda, sharing habitat with the giant pandas. Although they are unrelated species. And among locals they were known as firefoxes, which is a way cooler name. The picture is from Wikipedia. T liked the more fearsome snow leopards and cheetahs. Yet she was more than a little freaked out by the tiny, mostly harmless, insects in the Insectarium. This is by far the best display of insects I’ve ever seen. There are two main parts. One had endless terraniums of all kinds of varieties of bugs. And then there was the Butterfly Garden, a cathedral-size glass enclosure where thousands of butterflies fluttered amok. It was magical to wander among them. The zoo is worth the visit just for this feature. The zoo is closed on Wednesdays. The official website’s directions aren’t so good, so here’s my version. To get there, take the Keio Line Express from Shinjuku Station to Takahata-Fudo Station. Then take the Tama Dobutsuen Line to Tama Dobutsu-koen Station, which is a 4 minute ride. You could also take the monorail from Takahata-Fudo, but it costs a little extra. It takes 40 minutes total. Since this is the 50th anniversary of the zoo, there were new exhibits that were being worked on when we were there. They should be completed now. This is a great excursion out of the urban center. Top photo by T. Funada. 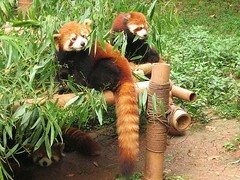 Red Pandas from Wikipedia commons. Wind, your blog is exquisite. What a fine artist you are, with a wide view and a sharp-pointed quill. And such beautiful photos too.